In this age where the customers are prosumers, companies are realizing that customer experience and loyalty and rewards program are essentials in winning the competitive business battleground. The prosumers are becoming powerful and demanding to the companies they are dealing with. In this situation, the companies are now required to always be on their toes to respond accurately to the needs of these prosumers. Having noted this, The Customer Lovefest slated this August 27 – 28, 2015, New World Hotel, Makati City is an event that provides learning opportunities regarding customer experience management and loyalty and rewards program. The first day will of the event will be for the Customer Experience Management Conference the pool of speakers are led by Ms. Margot Torres, Vice President for Marketing, McDonalds Philippines; Mr. Bruno Cristol, General Manager, Dusit Thani Hotel; Ms. JV Wong, Chief Executive Igniter, People Ignite; Ms. Michelle Patel, Managing Director, Satisfind; Ms. Germaine Reyes, Managing Director, Synergy Business Consultancy; and Miguel Cuneta, Co-Founder, Satoshi Citadel Industries. 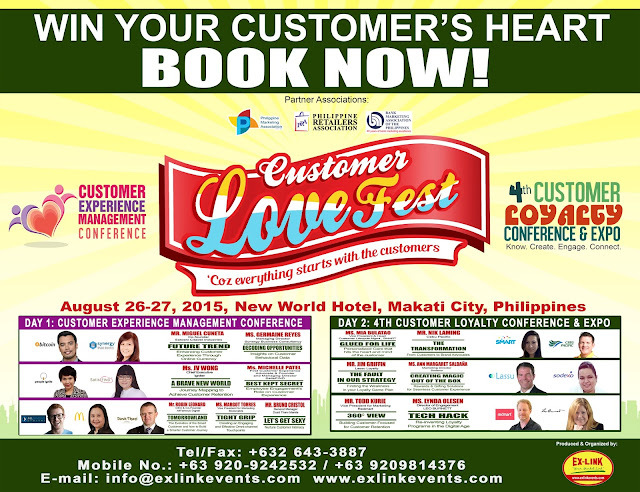 The Customer Experience Management Conference is the first conference in this subject matter in the country. This is an important turning point for companies, in particular, retailers in improving how the customers connect with the business. The second day is for the 4th Loyalty and Rewards Conference, an event that is dedicated on how to maximize the loyalty and rewards program as a tool in increasing and retaining customers. Ms. Mia Bulatao, Vice President and Head for the Customer LifeCycle Management lead the 4th Loyalty and Rewards Conference pool of experts, SMART Communications. Other speakers are Mr. Nik Laming, Cebu Pacific; Ms. Lynda Olesen, Director of Engagement, Leo Burnett; Mr. Jim Griffin, Lassu Loyalty; Ms. Ana Margaret Saldana, Marketing Director, Sodexo; and Mr. Todd Kurie, Vice President for Marketing, Red Mart. The Customer Lovefest is a conference that will provide scientific and creative revolution. Thus, all companies serious in further enhancing their customer experience management and loyalty and rewards program must send delegates to attend in this very special event. Philippine Retailers Association (PRA), Philippine Marketing Association and Bank Marketing Managers Association of the Philippines (BMAP) support the first Customer Lovefest. Exlinkevents – Business Events Organizer is the producer and organizer of the event. For more information, call tel. no. 643-3887 or text mobile no. 0920-9814376 or email info@exlinkevents.com.